Central tendency is a descriptive summary of a dataset through a single value that reflects the center of the data distribution. Along with the variability (dispersion) of a dataset, central tendency is a branch of descriptive statistics. The central tendency is one of the most quintessential concepts in statisticsBasic Statistics Concepts for FinanceA solid understanding of statistics is crucially important in helping us better understand finance. Moreover, statistics concepts can help investors monitor. Although it does not provide information regarding the individual values in the dataset, it delivers a comprehensive summary of the whole dataset. Mean (Average): Represents the sum of all values in a dataset divided by the total number of the values. Median: The middle value in a dataset that is arranged in ascending order (from the smallest value to the largest value). If a dataset contains an even number of values, the median of the dataset is the mean of the two middle values. Mode: Defines the most frequently occurring value in a dataset. In some cases, a dataset may contain multiple modes while some datasets may not have any mode at all. Even though the measures above are the most commonly used to define central tendency, there are some other central tendency measures, including, but not limited to, geometric meanGeometric MeanThe geometric mean is the average growth of an investment computed by multiplying n variables and then taking the n square root. In other words, it is the average return of an investment over time, a metric used to evaluate the performance of an investment portfolio.The geometric mean formula can be broken down to show, harmonic mean, midrange, and geometric median. The selection of central tendency as a measure depends on the properties of a dataset. For instance, mode is the only central tendency measure of categorical data while a median works best with ordinal data. Although mean is regarded as the best measure of central tendency for quantitative data, it is not always the case. For example, mean may not work well with quantitative datasets that contain extremely large or extremely small values. The extreme values may distort the mean. Thus, you may consider other options of central tendency. The measures of central tendency can be found using a formula or definition. Also, they can be identified using a frequency distribution graph. 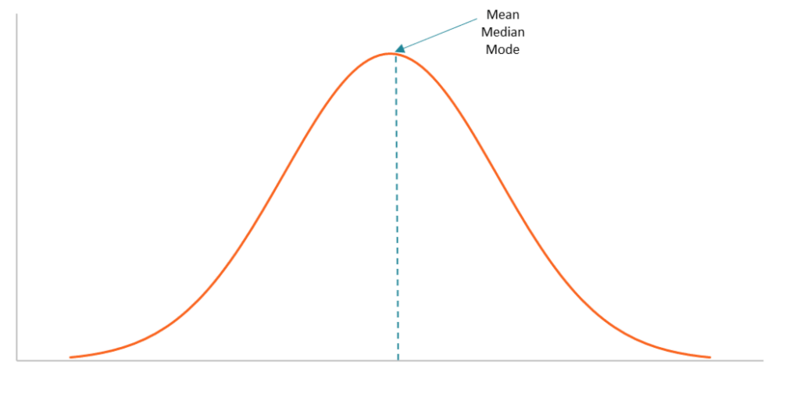 Note that for the datasets that follow a normal distribution, the mean, median, and modeMODE FunctionThe MODE Function is categorized under Stats functions. The function will calculate the most frequently occurring value from a list of supplied are located on the same spot on the graph. Quantitative AnalysisQuantitative AnalysisQuantitative analysis is the process of collecting and evaluating measurable and verifiable data such as revenues, market share, and wages in order to understand the behavior and performance of a business. In the era of data technology, quantitative analysis is considered the preferred approach to making informed decisions.